Overload, surge and atmosphere discharge electric protect. Access to the software, features, photos, accessories ... of our discontinued products. 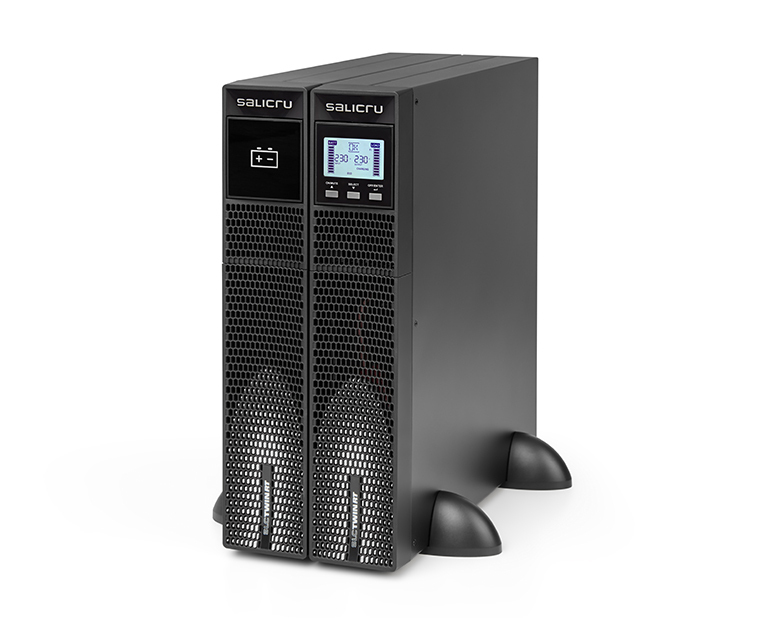 Salicru’s SLC TWIN RT2 UPS range is a highly advanced continuity solution for the electrical protection of critical systems. 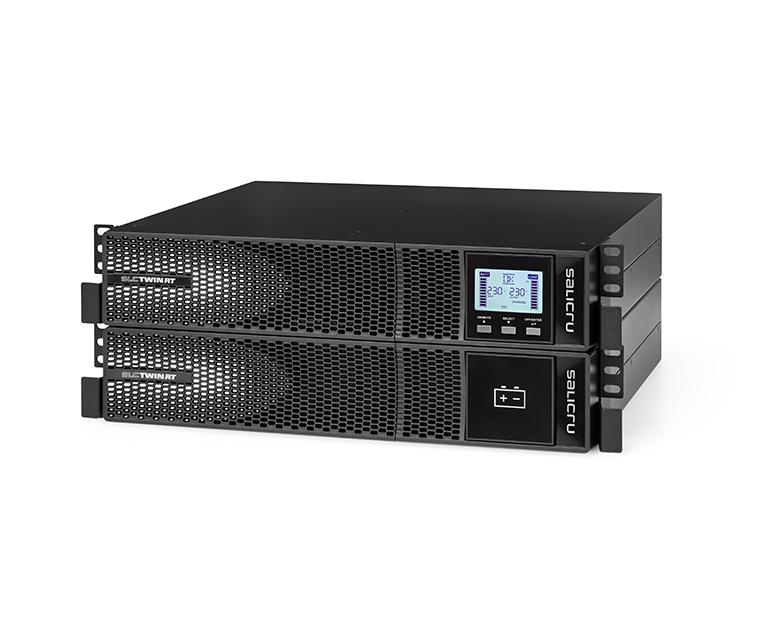 It combines the most reliable double-conversion technology (AC/DC-DC/AC) on the market and boasts a unity output power factor (VA=W) to enable it to power systems with high energy requirements, while offering high operating efficiency. 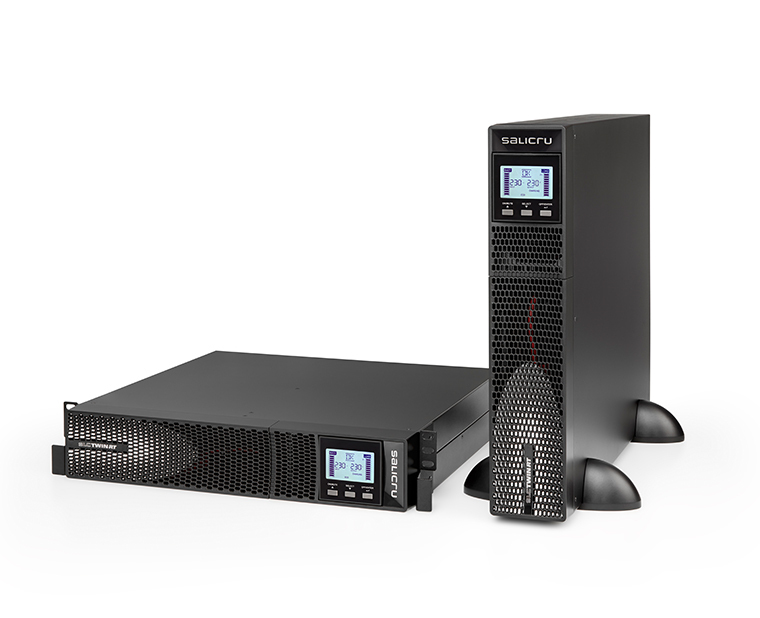 With a range of power ratings from 700 VA(W) to 10,000 VA(W), it comes in a 2U (up to 3 kVA) or 4U rack format, convertible to tower format, with a swivel mount LCD display, according to the needs of the facility. Also available are solutions with an extra charger and additional battery modules for applications that require greater backup. In terms of communications, it features an RS-232/USB interface (compatible with HID protocol for devices up to 3 kVA) and a smart slot that can optionally hold an SNMP card, MODBUS or potential free contacts; also available are software packages for local or virtual monitoring and management of protected devices. Other outstanding features include: 50/60 or 60/50 Hz frequency converter, emergency stop (EPO), programmable outputs for critical/non-critical loads (up to 3 kVA) and system operation in parallel (up to 3 units for devices from 4 kVA). 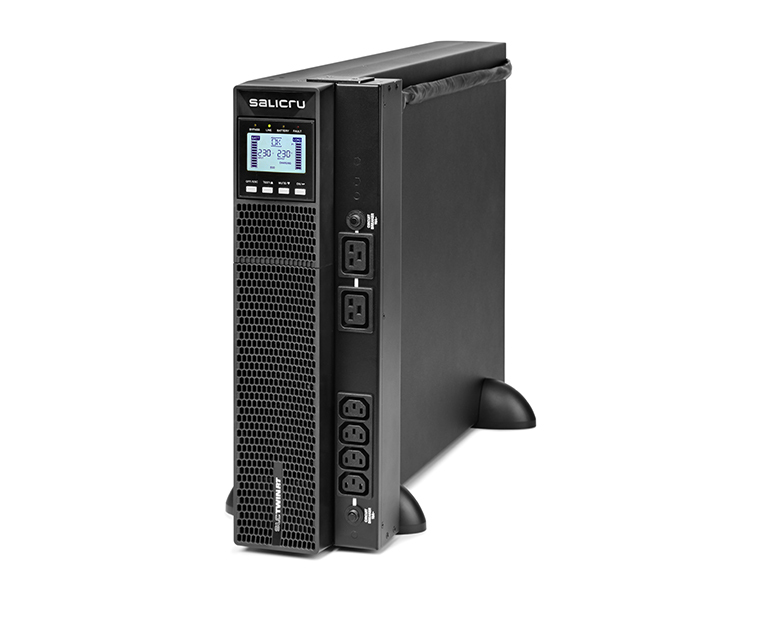 Salicru’s SLC TWIN RT2 series offers, in a compact format, all of the necessary features for the protection of applications that require a high level of security in the event of any type of electrical disturbance, such as IT servers, voice and data networks, CAD/ CAM, document management, unified communications (UC) and video streaming. Control panel with swivel mount LCD display and keypad. Includes pedestal (pedestal mount) and lugs (rack mount). Backup extensions available for all power ratings. UPS models with extra charger for backup extensions. Downloadable monitoring software for Windows, Linux and Mac. Smart slot for SNMP/potential-free contacts/MODBUS. 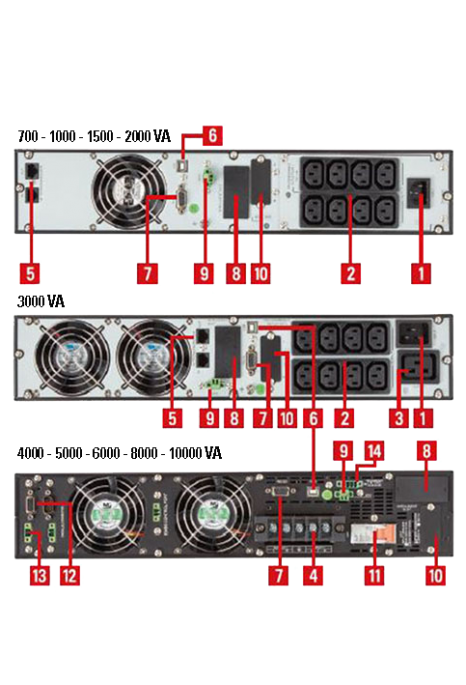 (1) Except for backup extensions from 4 kVA. (2) For devices of up to 3 kVA. (3) For devices from 4 kVA. Plug (IEC 14 for 700, 1000 and 1500 VA models; IEC 20 for 2000 and 3000 VA models). 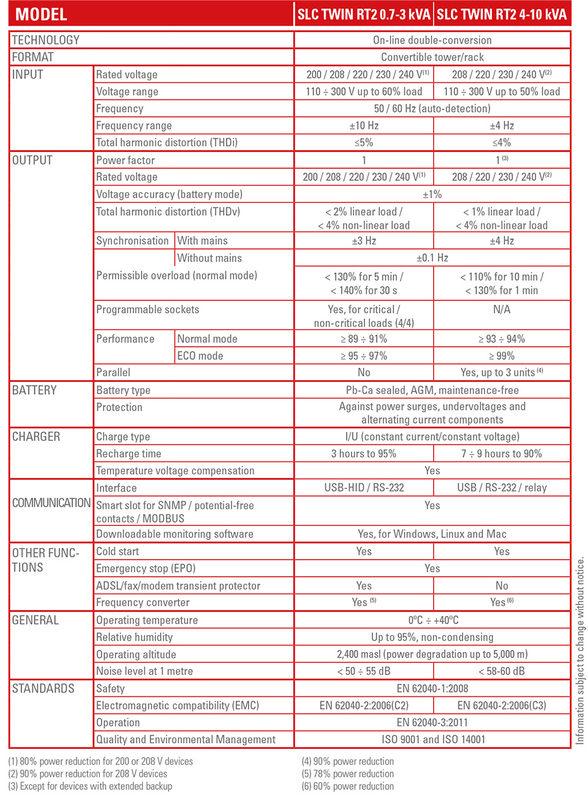 Sockets (8 x IEC 13), programmable critical (x4) / non-critical (x4). Socket IEC C19 (only for 3000 VA model). Smart slot for SNMP/potential-free contacts/ MODBUS. Connection for battery module (only in models with extra charger). With performance of up to 99%, a significant energy saving can be achieved without reducing reliability and security in the protection of critical loads. 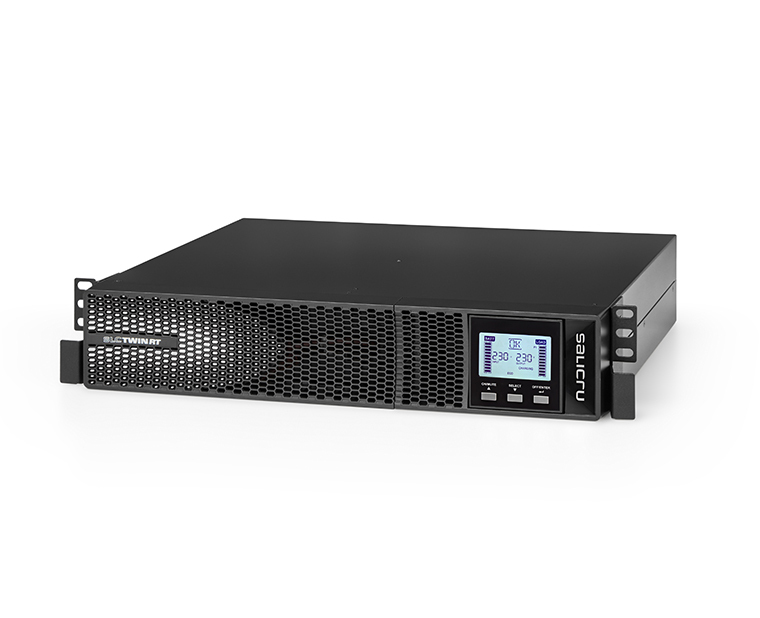 With a unity output power factor, maximum power in watts (W) is delivered, thereby optimising the always limited space in racks or server rooms. Convertible tower/rack thanks to the accessories included (rack handles, tower pedestal), swivel mount display. Intuitive LCD for operation and configuration, with optical and audible warning devices. Easy segmentation of sockets between critical/non-critical loads. UPS managing and monitoring in a heterogeneous IT networks, where different platforms coexist, becomes almos impossible, because the less common operating systems on the market do not have that such software.The RCCMD is an application that allows the simultaneous and secure shutdown of the 95% of existing platforms. Like the most comprehensive monitoring software, the RCCMD can send messages or commands to different clients of the network. For those networks which have more than one UPS to feed it and it requires a concentration monitoring from a single command post, UNMS II software (UPS Network Managament System) is the ideal solution. UNMS II allows managing multiple installations of all those units that have an Ethernet adapter SNMP / Web Adapter and / or sensors. UNMS II packages are available in 9, 25, 50 or 150 licenses. SNMP adapter to integrate the equipment in a IT network by using an IP address. It includes adapter, CD with programming software, configuration cable, MIB (Management Information Base) and user manual. Available in card or box formats. Public and industrial communication protocol that allows controlling and monitoring of the device. Communication over an RS-232 port. It allows extending the communication functions of an equipment through a RS-485 or Ethernet connection. Format card. These are potential-free relays that are used to receive an on/off signal for the automatic operation of a device. 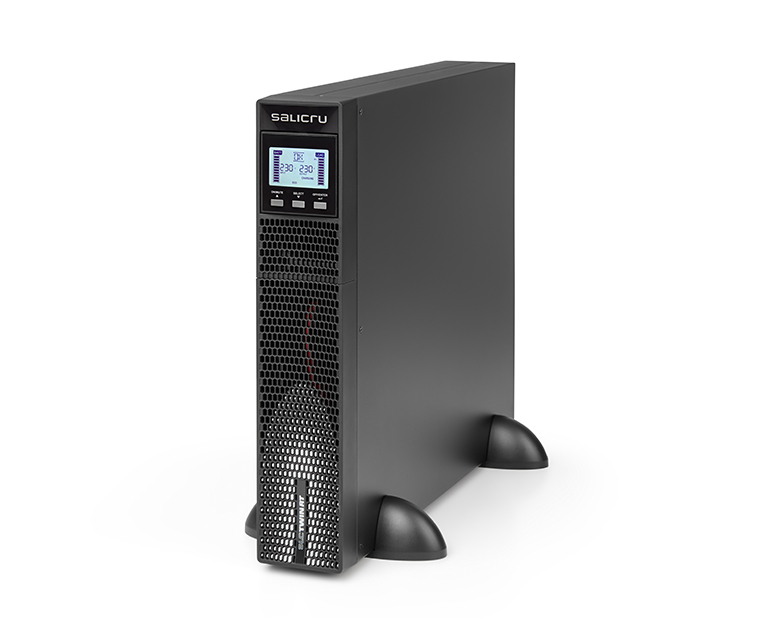 For backup requirements greater than standard, one or several battery modules connected to the UPS can be installed. 16A transfer system with RS-232 communication port and dry contact port, which allows the user to choose the feeding of the load from two different power supplies and to set the tolerance range of the priority mains, among other parameters. Telescopic guides for installation of SPS Advance RT2 and SLC Twin RT2 UPSs (UPSs or battery modules) in cabinets with depths of between 480 mm and 780 mm. Telescopic guides for installation of SPS Advance RT2 and SLC Twin RT2 UPSs (UPSs or battery modules) in cabinets with depths of between 550 mm and 1.100 mm. It used to adapt the equipment to other different nominal voltages 3x380 / 400/415 + N V.
Electrical device that provides galvanic isolation between input and output, and adjust tension. Salicru researches and develops power electronics equipment to ensure a continuous, clean and reliable power supply. Copyright © 2019. Salicru. All rights reserved . INFORMATION ON DATA PROTECTION OF SALICRU S.A. Purposes: To send you information about our products, including by electronic means. Legitimacy: Consent of the interested party. Recipients: No transfers of data to third parties are anticipated, except in the event of legal requirement. Additional information: You can find additional information by clicking on Legal Notice. This website is the property of Salicru S.A., holder of Tax Identification No. A08435356, with registered office at Avda. De la Serra, 100 - 08460 Palautordera and registered in the Company Register of Barcelona (Spain) with the following registration details: H. 34468 F. 98 T. 3242 L. 2605 S. 2ª INSC. 1ª N.I.F. A08435356. This Website is governed by regulations exclusively applicable in Spain, to whom both Spanish and foreign users are subject. We may, at any time, unilaterally and without prior notice, modify the presentation and configuration of our Website, expand or reduce its services, or even delete it and its services and content from the Internet. All content, texts, images, trademarks and source codes are owned by us, or by third parties from whom we have acquired rights of exploitation, and are protected by intellectual and industrial property rights. The user only has the right to private and non-profit use of the intellectual property, and requires express permission to modify, reproduce, exploit, distribute or exercise any right belonging to the owner. Access to our Website is free of charge and does not require prior subscription or registration. In view of the impossibility of monitoring the information, content and services offered by other websites that can be accessed through links on our website, we inform you that we are fully exempt from liability for any kind of damage or harm resulting from use by the user of these external websites. Who the data controller of your data is. The purposes of collecting the data that we request. The legitimacy for its processing. How long we store it. Your rights and how to exercise them. Purpose: To provide a means for you to contact us and for us to answer your enquiries and send you information about our products, services and activities, including by electronic means (email, SMS, etc. ), if you tick the acceptance box. If requested, to send you price quotes for our products and services by electronic means. Legitimacy: The user’s consent when making enquiries or requesting price quotes through our contact form and by ticking the acceptance box for receiving information. Storage: Once you have made your enquiry or sent information through our form or your email has been answered if you have not generated a new processing, and if you have accepted the receipt of commercial information, until you request its cancellation. Purpose: To deal with your enquiries, respond to your requests and answer your questions or queries. If we receive your CV, your data may be used in our staff recruitment processes. Legitimacy: The user’s consent when making enquiries through the email address and/or, if applicable, when sending us your information and CV. Storage: Once your enquiry has been answered by email if you have not generated a new processing. Your CV data may be kept for 1 year for future staff recruitment processes. Purpose: To enable you to participate in current and future staff recruitment processes. To check references. Legitimacy: Your consent when sending us your data and CV. Storage: Your CV data may be kept for 1 year for future staff recruitment processes. Purpose: To send you commercial information about our products and our newsletter periodically. Legitimacy: Your consent when registering for the receipt of commercial information. Storage: Until you cancel the receipt of commercial information. Purpose: To process your registration as a registered user in order to provide you with technical support or other exclusive services. If applicable, to send you commercial information about our products and our newsletter. Legitimacy: Your consent when registering as a user on our website and accepting the receipt of commercial information. Storage: For as long as you are a registered user and/or until you cancel. Purpose: To provide the services for which the contractual relationship was entered into and any resulting administrative tasks. To send you information about our products and services by electronic means. Legitimacy: The fulfilment of the contractual relationship. Our legitimate interest in keeping customers/distributors of our products informed. Storage: For the duration of the contractual relationship and in accordance with legal storage periods. Obligation to provide us with your personal data and consequences of not doing so. The provision of personal data requires a minimum age of 14, or, if applicable, the possession of sufficient legal capacity to enter into a contract. The personal data requested is necessary to deal with your enquiries, register you as a user and/or provide contracted services, and consequently, if you do not provide your data, we will be unable to deal with you correctly or provide the service you request. In all cases, we reserve the right to decide whether or not to incorporate your personal data into our databases for processing. Your data is confidential and will not be transferred to third parties, unless there is a legal obligation to do so. Anyone can withdraw their consent at any time if it has been granted for the processing of their data. Under no circumstances does the withdrawal of consent affect the fulfilment of the subscription contract or relationships generated previously. Request access to your personal data or rectification if it is incorrect. Request its erasure if, among other reasons, the data is no longer necessary for the purposes for which it was collected. Request processing limitation in certain circumstances. Request objection to the processing of your data for reasons related to your particular situation. Request the portability of your data in the cases provided for in the regulations. Other rights recognised in the applicable regulations. Where and how to request your rights: By means of a written notification to the data controller sent to its postal or electronic address (indicated in section A), indicating the reference ‘Personal Data,’ specifying the right to be exercised and identifying the personal data concerned. In the event of disagreements with the company in relation to the processing of your data, you may file a complaint with the Data Protection Authority (www.agpd.es). With the aim of safeguarding the security of your personal data, we inform you that we have adopted all of the technical and organisational measures necessary to protect it from alteration, loss and unauthorised access or processing. In order for us to keep your personal data up to date, it is important for you to inform us of any changes, failing which, we shall not accept any liability for its truthfulness. By making this Website available to the user, we wish to offer a quality service, using the utmost diligence in its provision and the technological means used. We shall not, however, accept any liability for the presence of viruses and other elements that may damage the user’s computer system in any way. We do not guarantee that the availability of the service will be continuous and uninterrupted. The USER is prohibited from any action on our website that causes excessive overloading of our computer systems, as well as the introduction of viruses, or installation of robots or software that alters the normal functioning of our website, or may ultimately cause damage to our computer systems. The USER assumes all responsibility arising from the use of our website. Ud. acepta el tratamiento de sus datos personales de conformidad con nuestra Política de Privacidad. Cookies are small files that are sent to and stored on the hard drive of the user’s computer through his or her browser when it is connected to a website. Cookies can be used to collect and store user data during connection in order to help provide the services requested and are not usually kept (session cookies), or to keep user data for other types of future services and can be kept indefinitely (persistent cookies). Cookies can be own or from third parties. Enable user navigation and the use of different options or services offered by the website, such as identifying the session, allowing access to certain areas, facilitating orders, purchasing, filling in forms, registration, security, enabling functionalities (videos, social media, etc.). Allow anonymous analysis of the behaviour of web users, measurement of user activity and creation of browsing profiles with the aim of improving websites. To contact Salicru directly or request information about any of our products, please fill in the following details and press send.